This mini-home is perfectly located to explore beaches and villages nearby. San José town is 5' by car, with all services: food stores, bank cashiers, restaurants and most beautiful wild sandy beaches: Genoveses, Mónsul... Natural paradise for diving, snorkeling, kayaking, hiking... Amazing volcanic coast, World Biosphere Reserve by UNESCO with warm and sunny weather throughout the year. It is a joy to stay at this Cabin. The owners had thought of everything that you would need for a clean, simple and relaxed stay. The setting is unique; with wonderful views all around. The highlights for us were the outdoor shower, seeing the stars and hearing the wildlife at night and the privacy. The owners have created a special and unique place for a short stay and we would recommend this Cabin to everybody. This cabin is really special. It's in a stunning location and has a wonderful secluded feeling. We had so many wonderful walks around the area. The cabin is perfect for a quiet retreat. We loved the outside space and outside kitchen! Everything was well maintained and lovely :) Thank you Sara and Jacobo! We very much enjoyed our stay in this lovely cabin. 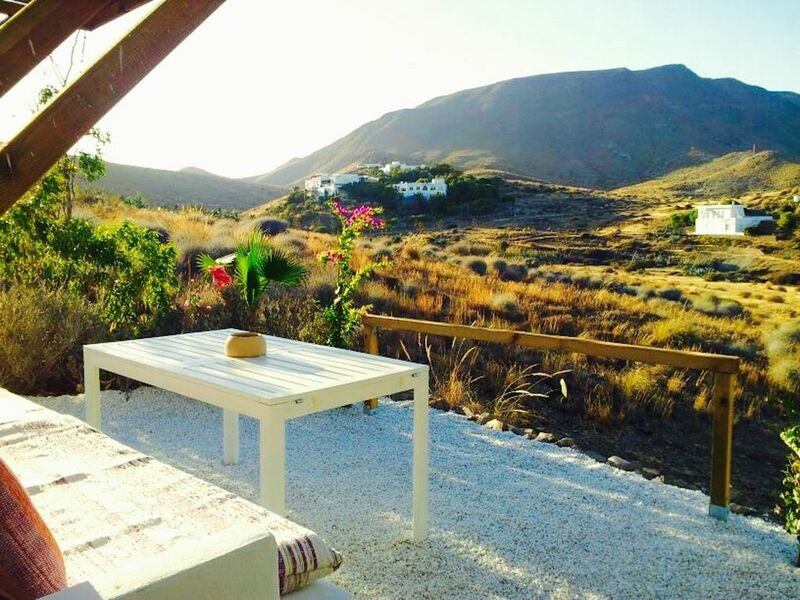 Superb location, close to beaches and for hiking and wonderful mtb routes nearby. The cabin is clean and well-tended with the most amazing views. Das Häuschen war ein Traum, supersauber unbd es wurde an alles gedacht. Die zusätzliche Außendusche hat meinem Mann besonders gut gefallen. Aus dem Badezimmer und aus dem Schlafzimmer hat man einen wunderschönen Blick in die Natur. Wir haben dort geschlafen wie die Säuglinge und haben uns gut erholt. Was auch von Vorteil ist, das es von dort nicht weit ist zu den schönsten Stränden des Parks und nach San Jose´. It was an adventure for us to stay here and one of the best holidays we ever had. Sara and Jacobo gave very good directions and detailed information about the surroundings. We followed some of their recommendations and we were never disappointed. Someday we will come back to this wonderful place! A car is needed to reach the guest house and enjoy the Natural Park.